Can you believe we are nearly in December already, and it’s Christmas Fayre season? Here are some of my Christmassy creations! I really enjoyed making these hoops using upcycled pieces, including denim, ribbons, jute twine and buttons. The little Stop signs are recycled from my children’s long-abandoned train set! 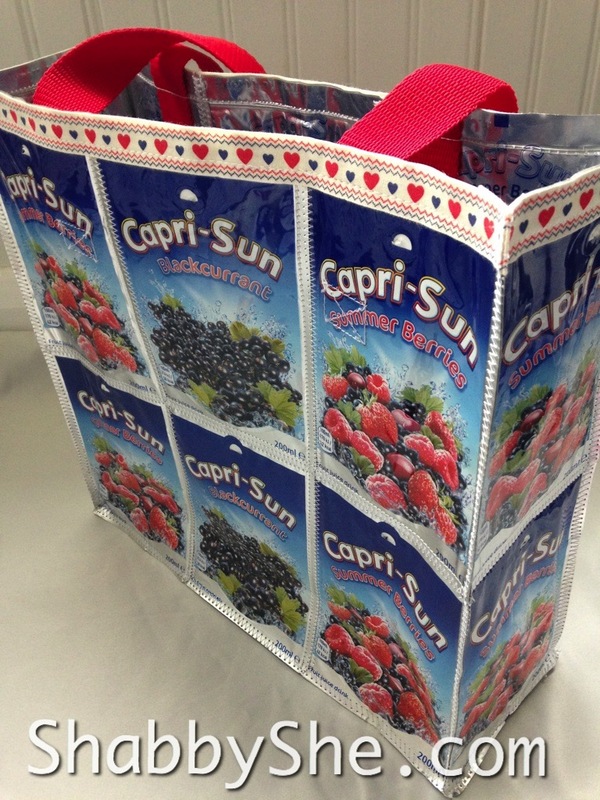 And it wouldn’t be a ShabbyShe stall without my classic favourites – all made from repurposed juice pouches! I made these glasses cases for my Etsy shop using soft felt and upcycled knit fabric – repurposed from girls’ clothing. The teal/turquoise case was so popular I’ve recreated variations on it since for other customers. I used simple white embroidery silk thread on the teal felt to create a swirly flower pattern to mirror the curves and swirls of the interior fabric. I love the simplicity of this one and it remains one of my all-time favourite makes. The black glasses pouch below is again lined with recycled material and here I experimented with French knots using a beautiful variegated embroidery floss in pale pink through to almost red. I made two heart shapes purely from French knot stitches and I think the overall effect with the ombre-style thread is lovely! 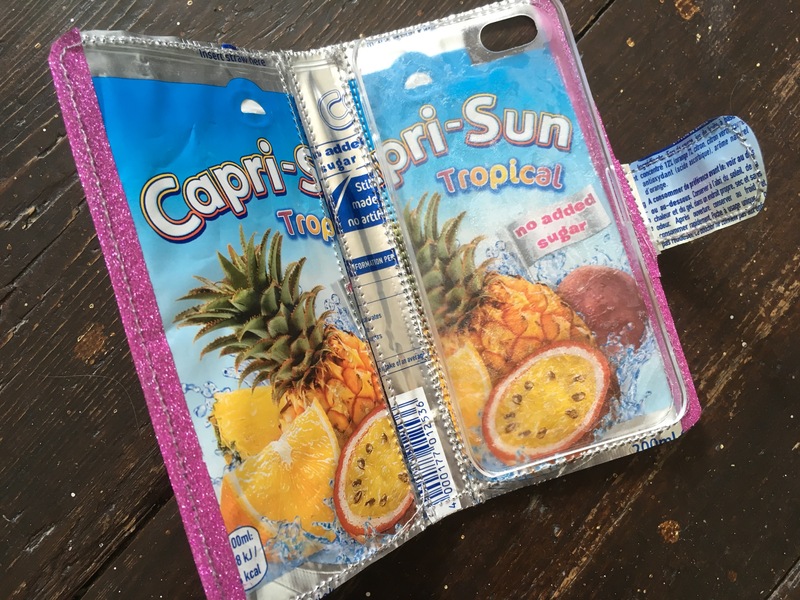 I’m back busily using my machine currently as my Capri Sun lunchbags are all the rage – maybe people are getting organised for the return to school (in September here in England)! I’ve been making a few blingy pieces recently which have proved very popular in my Etsy shop! Once I got hold of the glitter tape there was no stopping me, and I’ve made cosmetics pouches, pencil cases and phone sleeves with sparkly bits! 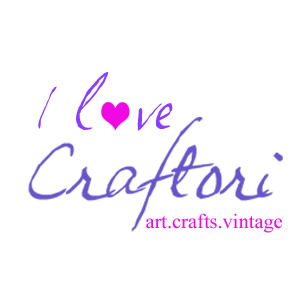 I find ribbon a very versatile medium too and love using it to add a decorative trim to lunch bags, pencil pouches and phone sleeves. This beautiful magenta ribbon has a lovely sheen with reflects light so nicely and pretties up this make up bag. Some of my flip phone cases, made from foil juice pouches! 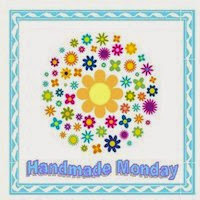 These are great fun to make if rather fiddly – the tricky part is shaping the hole for the camera on the back of the case. I took my inspiration from a phone case I bought online which started to fall to pieces after less than a year. I loved the design but surely they could be made to last longer, with more robust materials? Still one of my all time favourites! I love the end result – I have one for my iPhone 5 and have made them for iPhone 7, 6, 4G, Nexus and even a Huawei phone. I guess this is more of a furniture revamp than an upcycle: we bought a table, and it remains a table. Just now it is a fabulous, funky table! Here she is in her original state, minus some varnish on the legs. A perfectly nice and functional pine table with a heavy, solid feel that tells you it’s a quality item. We acquired the table at a local charity shop for a very reasonable price. There’s nothing wrong with it as it is, but we wanted to add a bit of interest to go with our new kitchen. Next job is priming the wood ready for the final colour (I must admit I quite liked it in white too!). 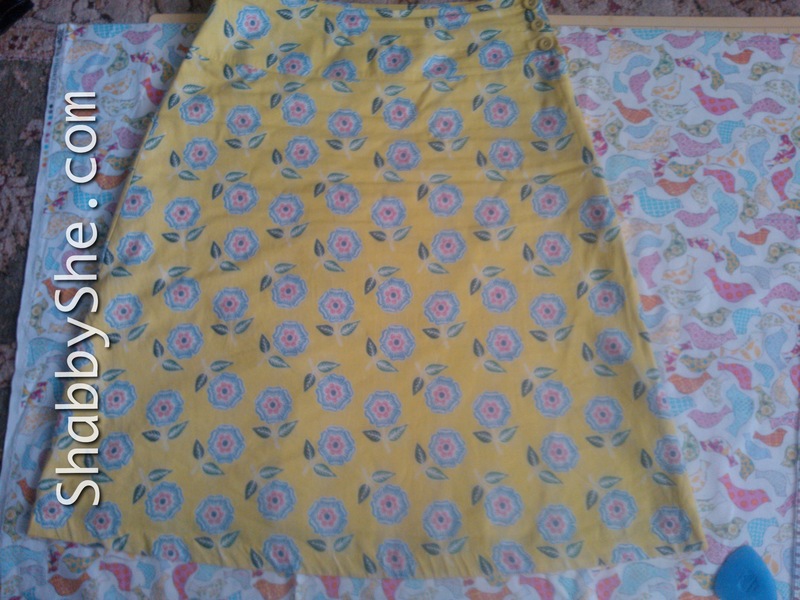 Here’s a glimpse of the final colour – a bold sunshine yellow which sets off the dark top rather nicely! (Excuse the decrepit old laminate flooring). The final part of the process involved adding a zinc top to the table – basically a large sheet of zinc which is moulded around the wooden top and then soldered in and hammered in place. I sadly don’t have a picture of this process as my hubby got on with it quite quickly. He enjoys a new craft as much as I do…! However I do have a detailed photo of some of the effects we tried out using cut lemons, scourers and sandpaper! I’ll show you more when we have a decent floor in place to show it off! 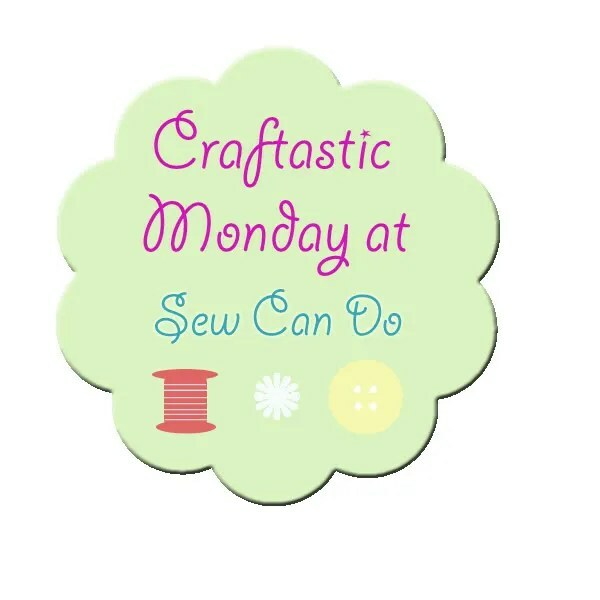 Back to School Craft: Pencil cases and more! 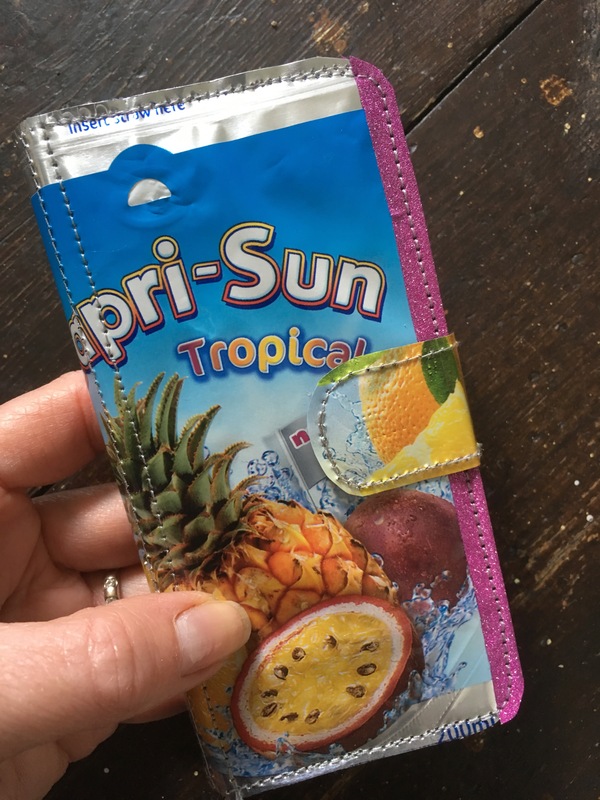 Some more fun makes using one of my favourite materials – juice pouches! 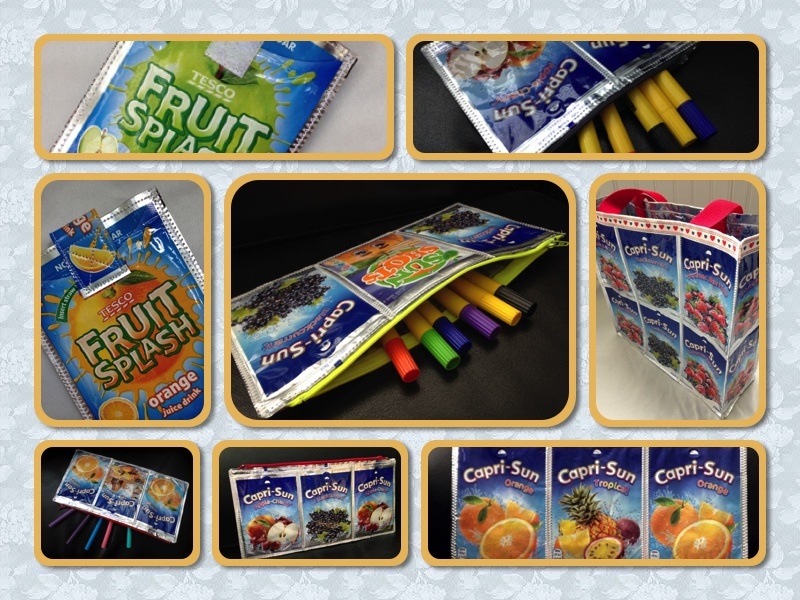 Clockwise from top left: Apple flavour mobile phone sleeve; small pencil case; shoulder bag with red straps; Tropical & Orange pencil case; Autumn fruits pencil case with red zip; Safari Animals juice pouch pencil case; Orange Fruit Splash mobile case; Sun Shots & Capri Sun pencil pouch with yellow zip. They are brightly coloured and fun, appealing to adults and kids alike. I find it’s always a talking point when I use my juice pouch lunch bag! They are great fun to work with as a material as they are already cut to a standard size (at least most brands are, more on that in a moment) but also they can easily be cut and manipulated to use for other purposes. I even made one which is four juice pouches wide (so 8 in total) for a friend’s son, who wanted to fit his 30cm ruler inside. I will definitely be making more of those! Finally, I got around to completing a shoulder bag – a bit of a longer task, but very satisfying when I see it all come together. My other tote bags sold a while ago and I kept meaning to make more but life got in the way! I’ve also stitched the front and back for another tote bag, this one featuring Orange and Tropical juices with a yellow strap. It’s come around quickly again this year – end of Summer term, which means the end of the school year here in the UK. I like to give my children’s teachers a little token to say Thank You for all their hard work & care over the school year. My children are always bereft to be leaving their favourite teacher! I made these little tissue pouches from preloved shirt cuffs! My son’s teacher likes purple and my daughter’s teacher is a fan of red – perfect! 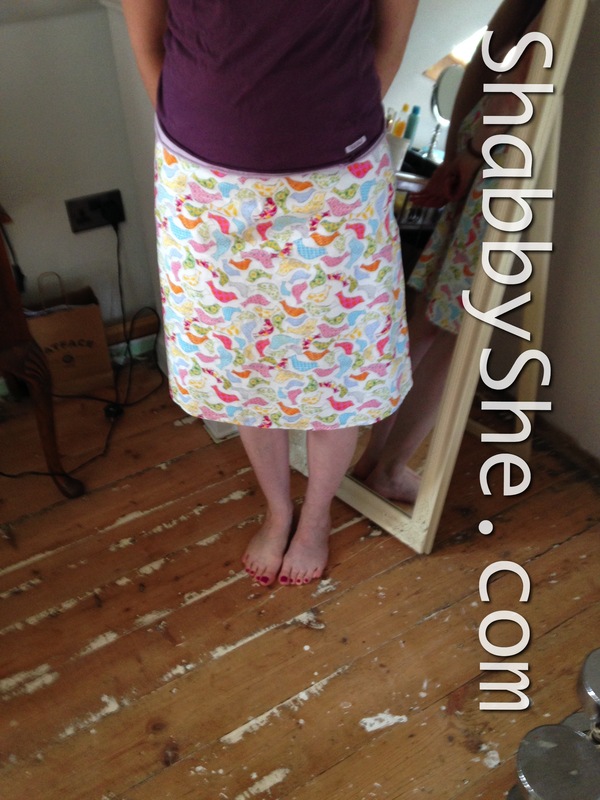 They were quite quick and easy to put together as I had already made some purple and mauve scrap binding by following this excellent post by Heather at The Sewing Loft and some red bias binding – again, there’s a brilliant tutorial by Deb at Sew So Easy on bias binding. The red pouch is the largest of the two: the red checked shirt I used had large cuffs for cufflinks. I made a feature of the button holes by leaving them in place and simply stitching the cuff into a purse shape using the red bias binding tape. 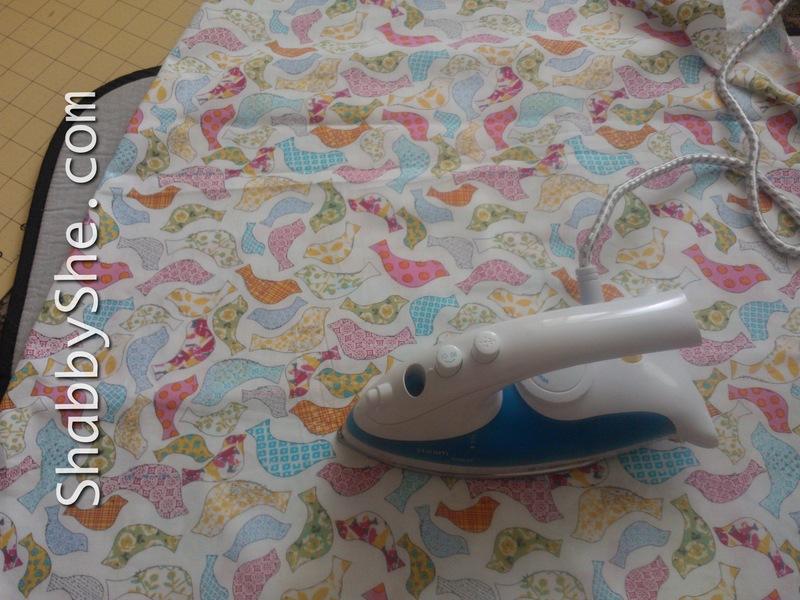 I then added the cute little cat buttons which add a feminine (or feline??) touch to the finished pouch. I’m really happy with how this one turned out – it is the perfect size to hold a pack of pocket tissues but can also be used as a little purse or make up pouch. 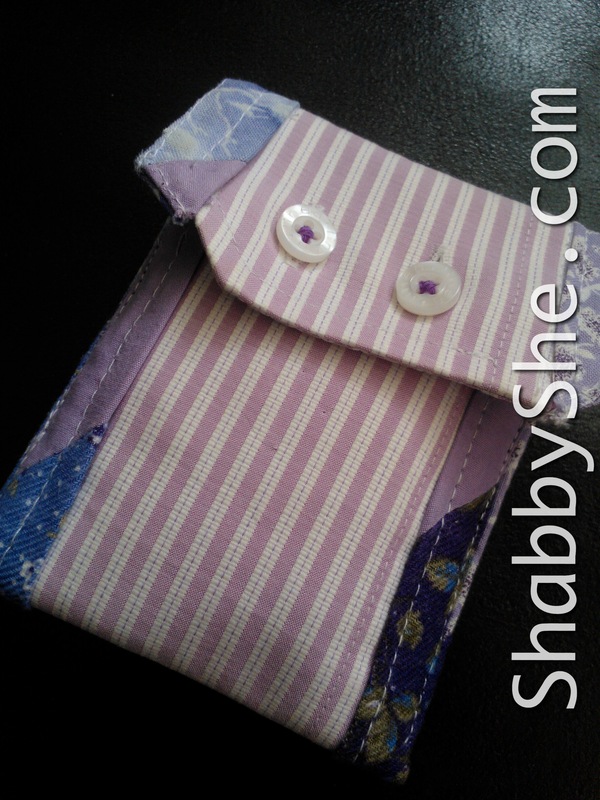 The mauve pouch is more of a mini pocket pouch as it was a standard size shirt cuff. I kept the orginal buttons for this pouch as I like the mauve stitching. I think the scrap binding goes perfectly with it! 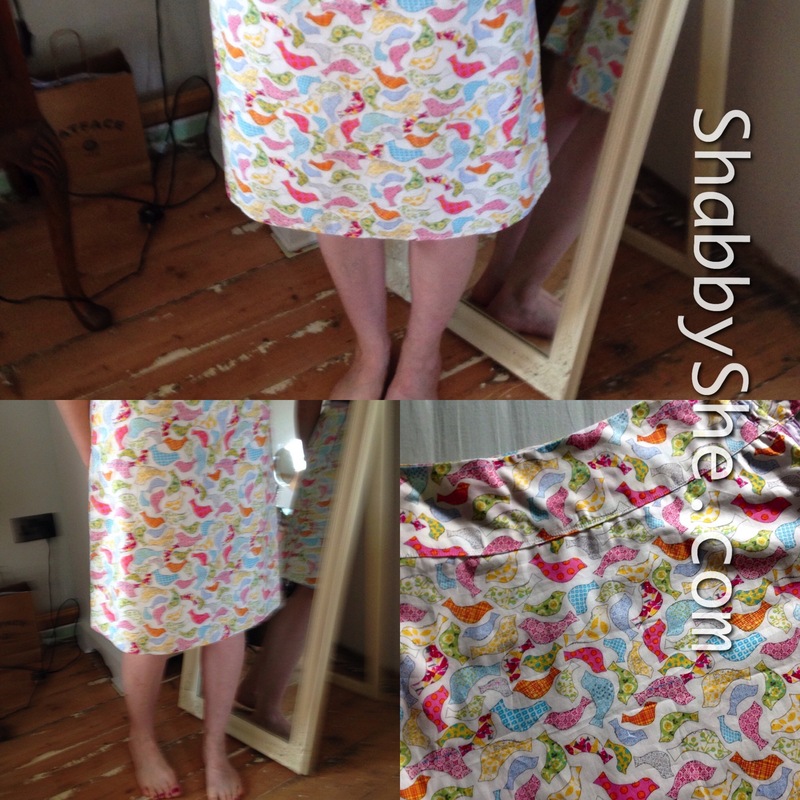 Scrap binding is so fun to make and is a great way to use up little pieces of fabric which are too small for other projects. The fabric in this binding was all pre-cut into quite small squares before they were given to me: I presume they were originally going to be part of a quilt. Anyway they look great as binding and give more colour and texture to a simple project like this teacher gift. As this pouch is smaller I could only include a few tissues and I folded them to fit! 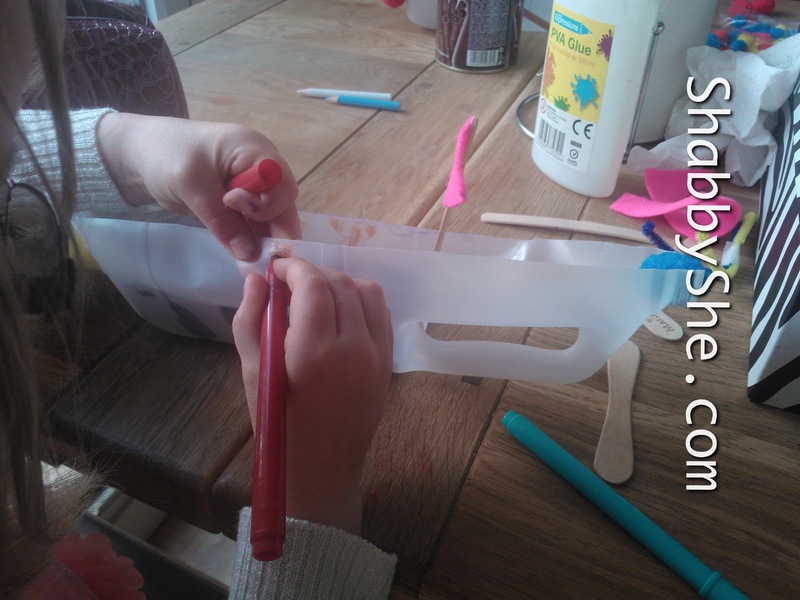 This was a fun afternoon in the school holidays – making boats from recycling scraps! 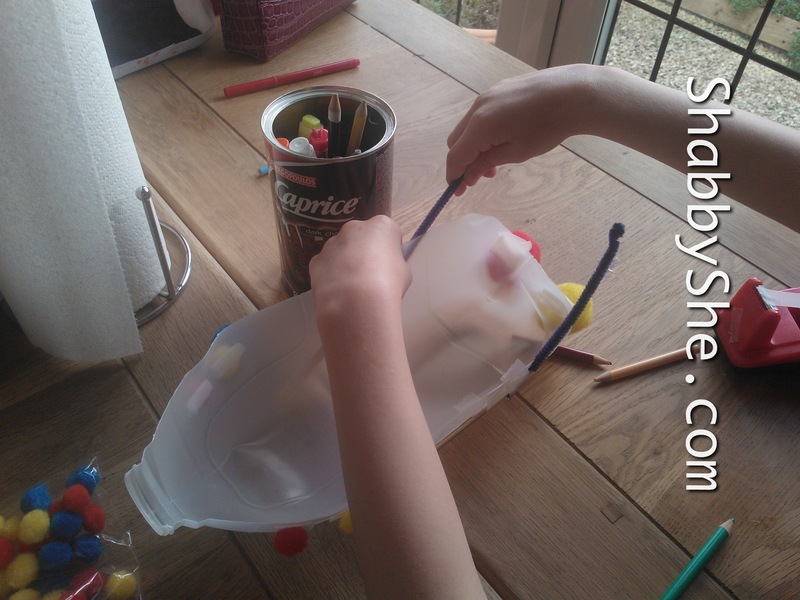 This craft is easy for children of any age and a great rainy day boredom-buster – plus when it brightens up you can go and float your boats in a stream! We had three children for this activity (my two plus a friend) and it was great to see 3 different approaches to decoration. 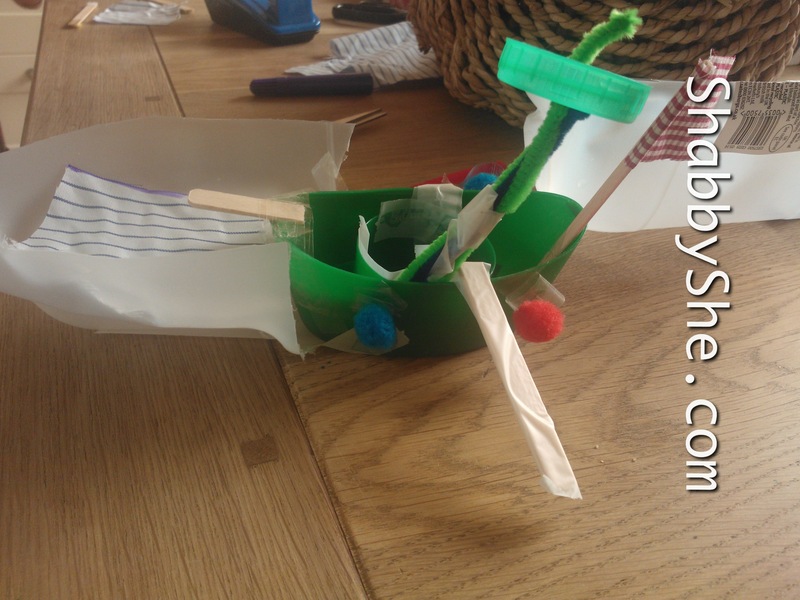 Here, pipe cleaners were attached to the hull to make a mast and flag pole. 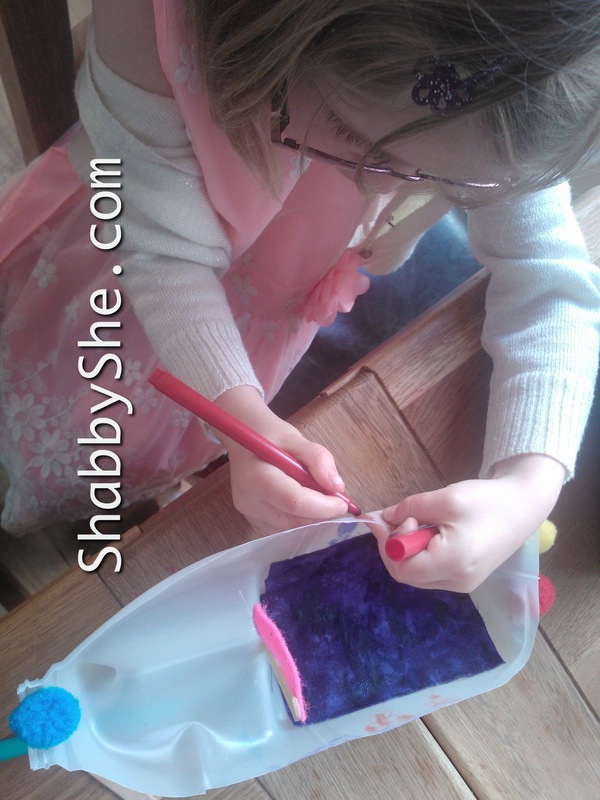 My daughter decided hers needed a purple carpet, pink pennant flag and several pompoms! 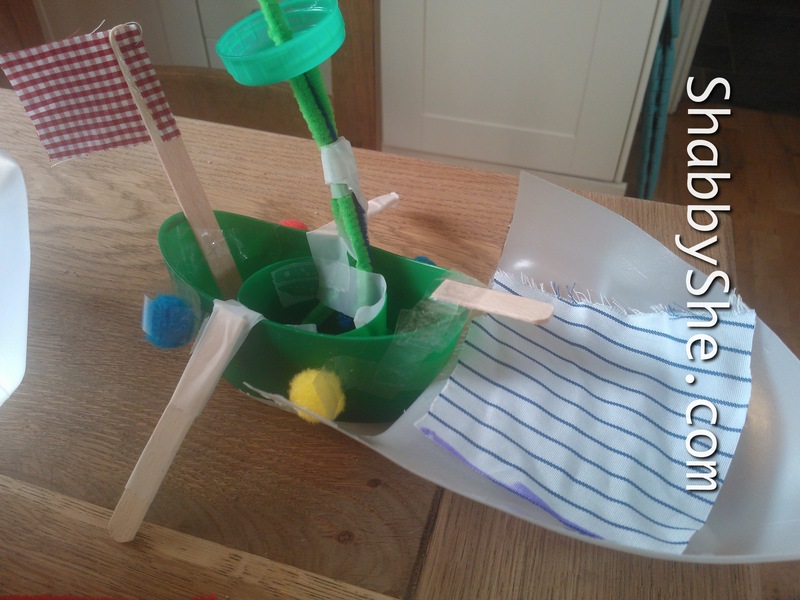 I particularly love the ingenuity that went into this craft – the main boat was a plastic detergent bottle cap, extended with pieces of milk carton, lolly sticks, pipe cleaners and a milk lid for the crow’s nest. 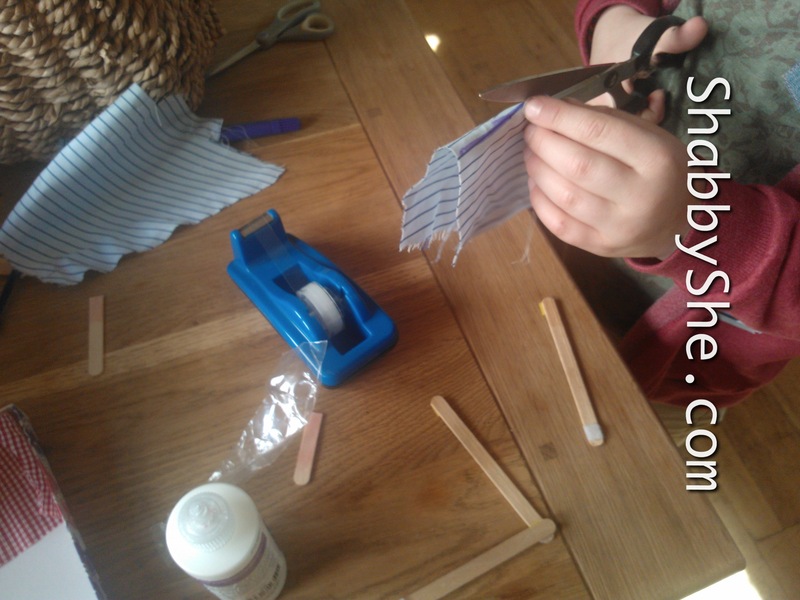 Don’t you just love it when kids really get into an idea and make it their own? A great way to spend a rainy day, which we followed up with a sailing contest in the stream!